To humans, the twin blue beams shining upward from lower Manhattan each Sept. 11 evoke solemn memories of the 2001 terrorist attacks. 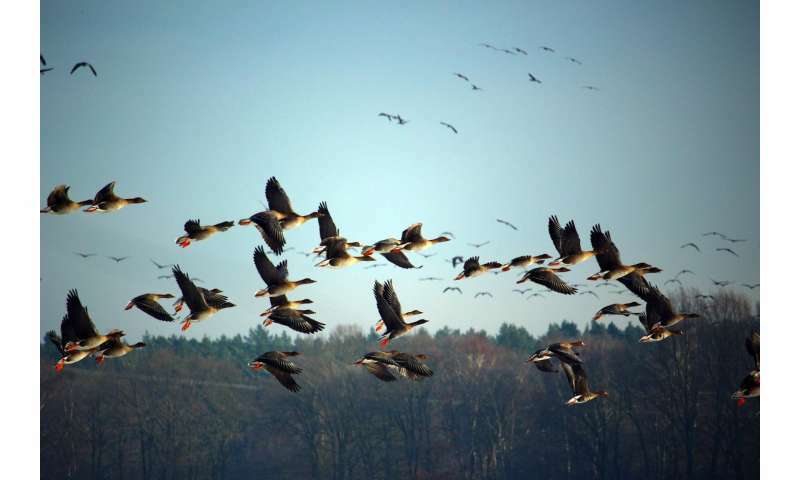 But to migrating birds, they're a potentially fatal attraction, according to a scientific study published Monday. During the seven-year study at National September 11 Memorial and Museum, researchers noticed thousands of birds were drawn to the annual light display, causing them to waste precious energy circling and calling and risking collisions with buildings or capture by predators. In 2015, for example, the count of birds within a half-kilometer (0.3 miles) of the tribute sight went from 500 to 15,700 within a half hour of the lights coming on. And when the lights were turned off, the birds went on their way within minutes. "Migrating is already hard enough for birds without this added danger from artificial light at night," said Susan Elbin, of New York City Audubon, co-author with researchers from Oxford University and the Cornell Lab of Ornithology. Their study, published in the Proceedings of the National Academy of Sciences, estimates that the light beams influenced more than a million birds—including warblers, thrushes and sparrows —over seven years of the one-night tributes. Researchers said they could not get an accurate count of how many birds actually died since some of them fell onto scaffolding, were snatched by scavengers or disposed of by maintenance workers. Most bird migration occurs at night, and billions of birds move through increasingly light-polluted skies. The authors recommend bright lights around homes, stadiums, offshore oil rigs and construction sites be turned off as much as possible during migration season, especially from midnight to dawn. Under a protocol established in 2002 to prevent harm to migrating birds, the tribute lights representing the fallen Twin Towers of the World Trade Center are turned off for 20 minutes whenever more than 1,000 birds are seen circling or flying dangerously low with frequent calling. The interludes of darkness allowed scientists to quantify changes in bird behavior. The birds were counted by more than 20 volunteers. Data from National Weather Service radar helped document the density and movements of birds, and acoustic monitors recorded vocalizations. "When you put up a tall tower or a tall building or lights that you shine straight up in the sky, you're not just affecting the birds that might fly over just that spot anyway. ... But we're changing migratory pathways to actually encounter these obstructions," said Longcore, who was not involved in the study. They claim birds will waste their valuable energy. Isn't that up to the birds to determine and not these science people? Predators will get them. Isn't that how nature works? The predators are not just meanies. They are part of nature's system of doing things. This article sounds too goofy to be based on anything but politics. Apparently, the authors do not like the 9/11 memorial but they don't want to tell us why. I think they should. They banned DDT and sentenced millions of Africans and Asians to death from malaria and sleeping sickness. All to save some bird eggs. Turning off lights seems minor. Why do scientists always think they know more than the common man?